There is a lot to consider when hiring a contractor to work at your home or on your property. The first step is making sure the company is properly insured to protect you and your property. Contracting work with an uninsured or under-insured company or individual can be a very costly error. What is a Certificate of Insurance (C.O.I.)? A valid COI proves liability insurance coverage in case of property damage and Workers Compensation to protect the homeowner from financial responsibility in the case of an injury or a fatal accident while the company is on the property. Certificates must list the insurance agent, known as “Producer”. Name of company or individual you hire will be listed as “Insured”. The COI must show the name of the insurance company who is providing the coverage. There may be more than one company providing insurance, one for Liability and one for Workers Compensation. 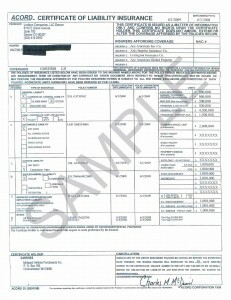 The homeowners name and address should be listed on the bottom left corner as “Certificate Holder”. “Policy effective date” and “Policy expiration date” must appear on the form. Duration is typically one year. The “Issuance date”, located on the top right corner, is the best indicator of validity. Certificates should be less than 30 days old. If the contractor has not made their monthly insurance payment, the certificate may not be valid. COIs must show “Insurance coverage amounts/limits”. How do I know a COI is valid? Most importantly, the COI provided to you should come directly from your contractor’s insurance agent. The agent will list you as the “Certificate Holder”. This is the only way to ensure your contractor is actually insured. Protect yourself and your home from lawsuits by uninsured contractors on your property by requesting a COI from your Certified Arborist. As always, Heath Tree Service is properly insured and will provide a current COI upon your request.